The global in vitro diagnostics market is likely to grow at a fast pace in the coming few years. The development of the condition-specific tests and markers and the rise in the adoption of point-of-care testing are projected to support the growth of the growth of the global in vitro diagnostics market in the next few years. In addition to this, the rising research and development activities and the introduction of new tests, which is projected to supplement the growth of the global in vitro diagnostics market in the coming few years. In 2016, the global market for in vitro diagnostics was worth US$55000 mn and is projected to reach a value of US$89862.2 mn by the end of 2025. The market is projected to register a healthy 5.60% CAGR between 2017 and 2025, states a new research study by Transparency Market Research. A tremendous rise in the geriatric population and the increasing prevalence of infectious and chronic diseases are estimated to support the growth of the global in vitro diagnostics market in the next few years. The increasing trend of personalized medicines and the rising rate of adoption of fully automated instruments are likely to accelerate the market growth in the coming years. On the flip side, the unfavorable reimbursement environment and the constant changes in the regulatory scenario are estimated to hamper the overall development of the global in vitro diagnostics market in the near future. Nonetheless, the presence of several lucrative opportunities are encouraging the key players to focus on developing economies, thus supporting the market growth in the near future. In the last few years, North America and Europe held a large share of the global in vitro diagnostics market in the next few years. The rising contribution from the U.S. and the presence of an advanced healthcare infrastructure are projected to supplement the growth of the in vitro diagnostics market across North America in the next few years. In addition to this, the extensive research and development activities and the rising awareness among people for a healthy lifestyle are further estimated to enhance the market growth in the near future. On the contrary, Asia Pacific is projected to witness a rapid growth in the coming years, owing to the rising demand from India, Japan, and China. The development of the healthcare sector, the increasing disposable income of consumers, and the presence of a large number of patients are likely to encourage the growth of the Asia Pacific in vitro diagnostics market in the near future. The global market for in vitro diagnostics is presently at a competitive stage with a high number of players operating worldwide. The rising emphasis of the key players on the research and development activities and the introduction of new technology to support the growth of the global market in the next few years. Moreover, the rising number of mergers and acquisition are likely to help the leading players in maintain their position and enhance the market penetration in the next few years. Some of the leading players that are engaged in the in vitro diagnostics market across the globe are Ortho Clinical Diagnostics, Becton Dickinson and Company, Sysmex Corporation, Thermo Fisher Scientific Corporation, Danaher Corporation, Diasorin, Siemens Healthineers, Biomerieux SA, Abbott., Qiagen N.V., F. Hoffmann-La Roche Ltd., Life Technologies Corporation, and Gen-Probe Incorporated. This report on in vitro diagnostics market studies the current as well as future prospects of the market globally. The stakeholders of this report include companies and intermediaries engaged in the manufacture, commercialization, providing in vitro diagnostics products as well as new entrants planning to enter this market. This report comprises an elaborate executive summary along with a market snapshot providing overall information of various segments and sub-segments considered in the scope of the study. This section also provides the overall information and data analysis of the global in vitro diagnostics market with respect to the leading market segments based on major types, applications, end users, and geographies. By technology type market further segmented into point of care, molecular diagnostics, immunoassays, clinical chemistry, whole blood glucose monitoring, hematology, clinical microbiology, coagulation and hemostasis, and others. On the basis of applications in vitro diagnostics market has been segmented as drug testing, infectious disease, oncology, metabolic disease, autoimmune disease, and others. Further the market has been segmented according to its end users that includes diagnostics laboratories, hospitals, academic & research centers, home care and others. Each of the market segments have been extensively analyzed based on the market related factors such as increasing adoption rate worldwide, and technological advancement, in various geographies. Moreover, historical year-on-year growth have been taken into consideration while estimating the market size. The market size and forecast in terms of US$ million for each segment has been provided for the period from 2015 to 2025. The report also provides the compound annual growth rate (CAGR %) for each market segment for the forecast period from 2017 to 2025, considering 2016 as the base year. The market overview section of the report explores the market dynamics such as drivers, restraints, and opportunities that currently have a strong impact on the in vitro diagnostics market and could influence the market in the near future. Market attractiveness analysis has been provided in the market overview section in order to explain the intensity of competition in the market across different geographies. The competitive scenario among different market players is evaluated through market share analysis in the competitive landscape section of the report. All these factors would help market players to take strategic decisions in order to strengthen their positions and expand their shares in the global in vitro diagnostics market. 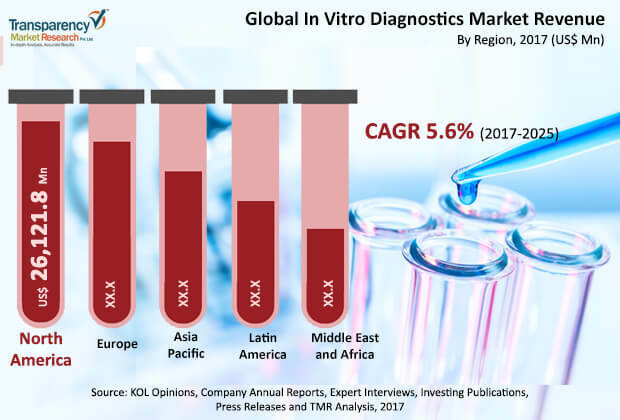 Geographically, in vitro diagnostics market has been segmented into five major regions: North America, Europe, Asia Pacific, Latin America, and Middle East & Africa. The market size and forecast for each of these regions has been provided for the period from 2015 to 2025, along with their respective CAGRs for the forecast period from 2017 to 2025, considering 2016 as the base year. The report also provides with market size and forecast for major countries in the respective regions. A detailed qualitative analysis of factors responsible for driving and restraining the market growth and future opportunities has been provided in the market overview section. This section of the report also provides with market attractiveness analysis, Porter’s five forces analysis, market strategy overview, and market share analysis by key players, thus presenting a thorough analysis of the overall competitive scenario in the global In Vitro Diagnostics Market. The key findings section included in the report would assist existing market players in expanding their market shares, and new companies in establishing their presence in the global In Vitro Diagnostics Market. The key players operating in the in vitro diagnostics market are Abbott., Becton Dickinson and Company, Biomerieux SA, Danaher Corporation, Gen-Probe Incorporated, Ortho Clinical Diagnostics, Life Technologies Corporation, F. Hoffmann-La Roche Ltd., Siemens Healthineers (a division of Siemens AG), Sysmex Corporation, Qiagen N.V., Diasorin and Thermo Fisher Scientific Corporation. The global in vitro diagnostics market is dominated only by few players such as F. Hoffmann-La Roche Ltd and Abbott that operates global market.